The One on Centre community meeting scheduled for the evening of Tuesday, July 31, 2018 has been postponed due to a gas leak near the Western Pennsylvania School for Blind Children. The meeting will be rescheduled for a later date. Please contact the Office of Councilperson Erika Strassburger at (412) 255-2133 or district8@pittsburghpa.gov with any questions. OPDC will update this page once a new date is selected. 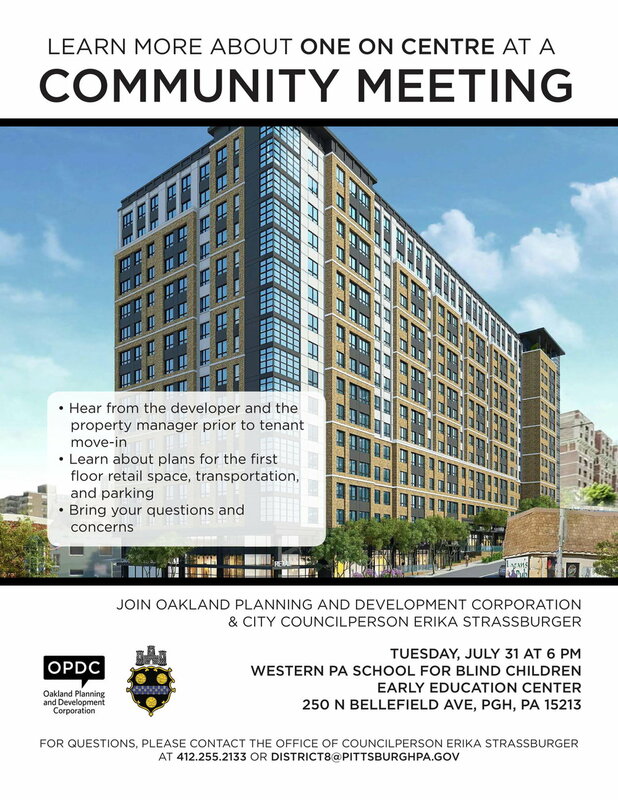 Please join Oakland Planning and Development Corporation and City Councilperson Erika Strassburger for a community meeting regarding the new apartment building, ONE on Centre, located at 372 N Craig Street. For further information, please contact the Office of Councilperson Erika Strassburger at 412.255.2133 or district8@pittsburghpa.gov.